Boxing has long been considered a hypermasculine sport harnessing masculine ideals of virility and aggression. It has resonated across millennia as an icon of sacred tradition that stretches as far back as the ancient Greeks with even earlier references to the sport in Mesopotamian cultures. the stunning punch, the left and right are gone. When thinking about martial contests, however, what might not be so readily apparent is that women have also enacted one or another form of martial ritual including boxing for just as long. 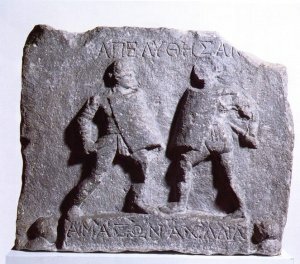 Other forms of Greco-Roman cultural representations include the marble relief sculpture depicting two female gladiators known as the Missio of Halicarnassus from the first or second century CE and the black-figured hydria of Atalanta and Peleus Wrestling from 550 BCE. Based on the myth of Atalanta, the hydria depicts her defeat of Peleus in a wrestling match at the funeral games of King Pelias. Given the importance of Funeral Games as “symbolic conflict” that both stand in for actual combat (the physical clashing of the bodies) and as a contest of honor, wherein the vanquished is raised up by the victor, the inclusion of female figures in such representations is certainly provocative. 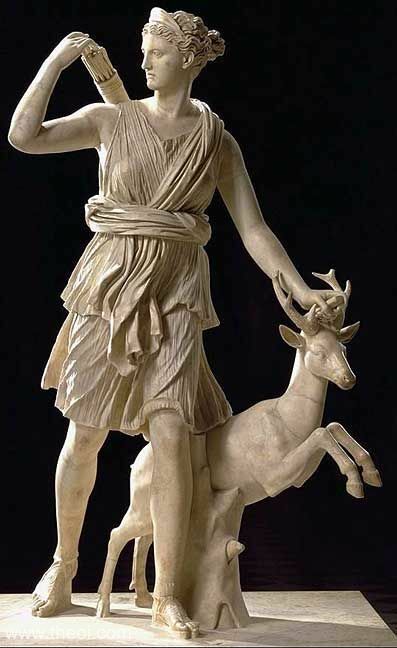 However, given that Atalanta is also depicted as a particular favorite of Artemis, Goddess of both the hunt and maidenhood, we can begin to tease out a notion of gender identity in Greco-Roman culture which allows for a “third way” if you will: that of the maiden huntress/warrioress that also links to the myth of the Amazons. It can be argued that such depictions are liminal, based on a time between girlhood and motherhood. In this in-between space these young women are depicted as small breasted and virginal, thus creating an otherness between maleness and femaleness, on the order of Goddess Artemis and Diana. The status of these figures makes them free to hunt and even pursue martial enactments of maleness, however, the price of doing so is to remain pre-sexual. 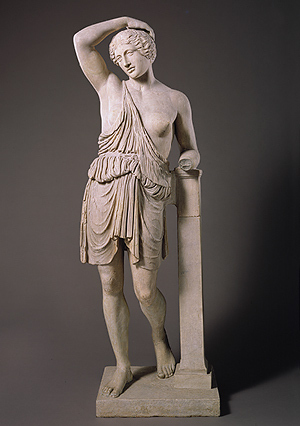 Statue of a wounded Amazon, 1st–2nd century A.D.
Roman copy of a Greek bronze statue, ca. 450–425 B.C. The myth of Atalanta is a perfect embodiment of this ideal. Atalanta enacts warriorness side-by-side with her shipmates Jason and the Argonauts, but can only do so as long as she remains a virgin. The depiction of the mythic women also inevitably shows them in short tunics rather than in long ankle length skirts – thus clearly mimicking the dress of Artemis and Diana. And in some cases, representing a depiction of actual cross-dressing: wearing a short tunic skirt instead of a long skirt. It should be noted that there are figures of Artemis in a long gown, however, those skirts typically open and show that she is free to run. To my way of thinking, these are important threads in considering the significant place of female fighting figures historically. Spartan training of young girls was also under the influence of the Goddess Artemis who was often depicted in a short tunic. Throughout Greece, girls participated in formal Games (though not the Olympics) primarily in foot races with aspects of religious ritual associated with such participation. Boddy, Kasia. Boxing: A Cultural History. London: Reaktion Books Ltd. 2008. Print. Herodotus. The Landmark Herodotus: The Histories. Fifth Impression Edition. Eds. Robert B. Strassler. Trans. Andrea L. Purvis. New York: Pantheon (2007). Print. Homer. The Iliad. Deluxe Edition. Trans. Robert Fagles. New York: Penguin Books, 1998. Print. Murray, Stephen. “Female Gladiators of the Ancient Roman World.” Journal of Combative Sport. July 2003. Web. 12 Mar. 2012. Papadopoulos, Maria. “The Women in Ancient Sparta: The Dialogue between the Divine and the Human.” SPARTA 6.2 (2010): 5-10. Print. Plutarch, The Parallel Lives. Loeb Classic Library Edition. N.P. 1914. Uchicago.edu Web. 18 Sept. 2011.